This is the spot where Francisco Pizarro founded the city in 1535. 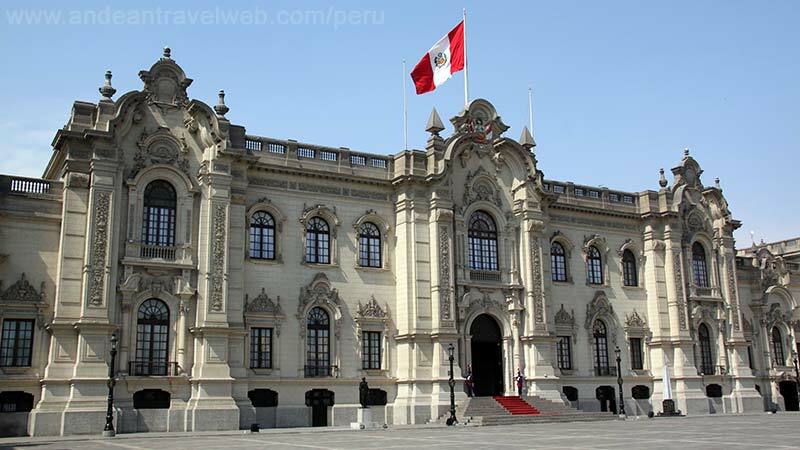 The north side is dominated by the Government Palace (rebuilt in 1937), home of Peru's president. You can watch the changing of the guard here at 12:00 each morning. On the east side of the Plaza you'll find the Cathedral. Construction of this church began in 1564 and was completed in 1622. Unfortunately is was reduced to rubble in 1746 by an earthquake and was subsequently rebuilt and completed by 1755. The supposed remains of Francisco Pizarro lie in a small chapel, the first on the right of the entrance, in a glass coffin. Open Mon-Fri 09:00-17:00, Sat 10:00-13:00, Entrance fee of 10 Soles (about US$3.70) includes entrance to the Religious Art Museum inside. 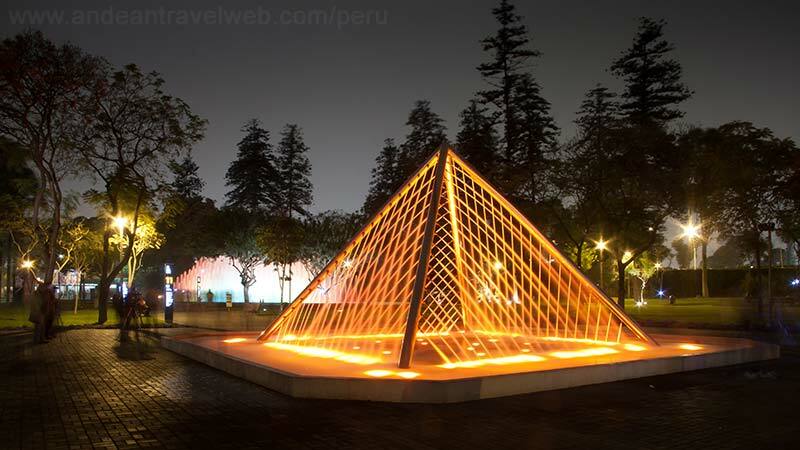 Miraflores is Lima's modern suburb with a nice park and plenty of shops and internet cafes. If you are already starting to miss home then you can find the likes of McDonalds, Burger King, Pizza hut and KFC to comfort you!! There are some good modern stores such as Saga Falabella and Ripley and just a block from the "Ovalo" (central roundabout) with can find a selection of quality handicraft markets (see shopping section below). 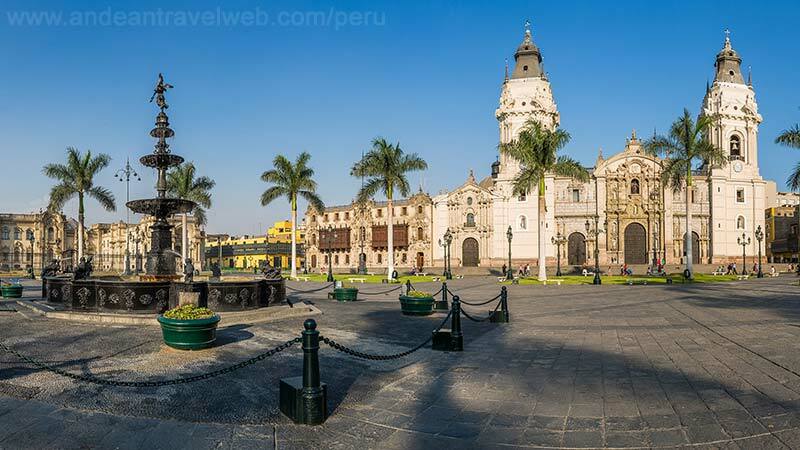 A ten minute walk from the Ovalo along Avenida Larco brings you to the "Larco Mar", a shopping centre with great views over the Pacific Ocean (includes shops, cafes & restaurants, multi-screen cinema, ten-pin bowling). During the day Miraflores can be rather characterless but things pick up when the sun goes down. There are plenty of good restaurants, street cafes, bars and clubs. Miraflores also plays host to the majority of good hotels and hostals (see recommended hotels in Lima). Unlike Central Lima, Miraflores feels much safer, although you still have to be careful with your belongings and avoid walking around very late a night. www.mirabusperu.com Mirabus is an open-topped double-decker sightseeing bus that tours around Lima visiting the main attractions. The company has a small kiosk in Parque Kennedy in Miraflores. They offer several sightseeing tours but the most popular is the Lima Day tour (details below). Be prepared to take your life into your own hands as the bus passes below many electric and telephone cable strung across Lima's chaotic streets. If you are travelling on the top deck don't stand up while the bus is moving as you may lose your head! Departs from Parque Kennedy and visits the Parque de la Exposicion, Plaza San Martin, Plaza de Armas de Lima with Cathedral, Palacio de Gobierno and Palacio Municipal, Catacumbas de San Francisco, Parque de la Muralla, La Plaza del Congreso, Parque Universitario, Parques and Malecones de Miraflores, Centro Commercial Larcomar. Return to Parque Kennedy in Miraflores. Departure times: Daily 09.30 am and 02.30 pm Price: S/. 60 Duration: 3 hours Departure from Parque Kennedy (Miraflores) The entrance fees for 'San Francisco' and 'Parque del la Muralla' are included. Lima is not a great place to go to the beach. Water is heavily polluted, cold and there are strong currents. They also have a bad reputation for crime. However this doesn't seem to put the locals off who swarm to the beaches in their thousands during the summer months (Dec-Mar). If you still decide to join the locals, be aware of thieves and don't leave anything unattended for a second. You've been warned. See our webpage Best Beaches in Peru or Surfing in Peru for more info. El Circuito Magico del Agua is a series of 13 multi-coloured illuminated fountains located about 500m to the south of the Parque de la Cultura. The jets from the highest fountain can reach heights of 80m and the experience is enhanced with a laser show and Peruvian folk music. There are 4 shows each night. It's a good chance to see Peruvian families relaxing and enjoying themselves. Prepared to get wet! Located between 6th and 10th blocks of Avenida La Marina, Pueblo Libre. If you've forgotten to buy everyone at home a present after visiting Peru then this maybe your last opportunity to do so. This large collection of market stalls sell crafts only, including woollen and alpaca clothing, carved wood objects and jewellery. There's a huge selection and bargaining is expected although the prices in other parts of Peru are cheaper. Don't take any valuables with you as there are always thieves about. The handicrafts markets in Miraflores on Avenida Petit Thouars (blocks 51-54) has a similar, although slightly more expensive, selection.